“Do what feels right.” “Follow your heart.” That’s the sort of advice we’ve steeped in living in Western culture. Problem is, that’s not really good advice. Sometimes your heart is wrong. Sometimes what feels good isn’t right. Speaking more specifically to Christians, one of the hard truths we need to learn is that something can feel okay to you yet still be a sin in God’s eyes. Just because you’re okay with something doesn’t mean God is. And, on the flip side, your dislike of something doesn’t make it a sin. 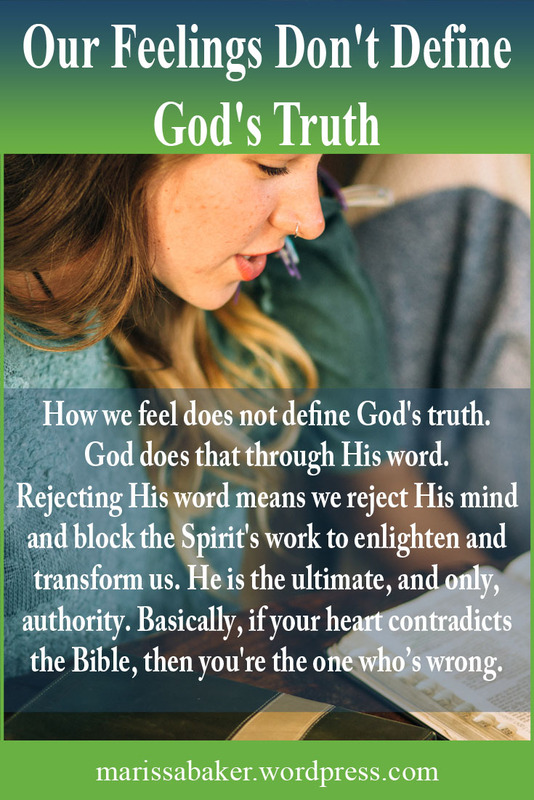 In short, how we feel does not define God’s truth. 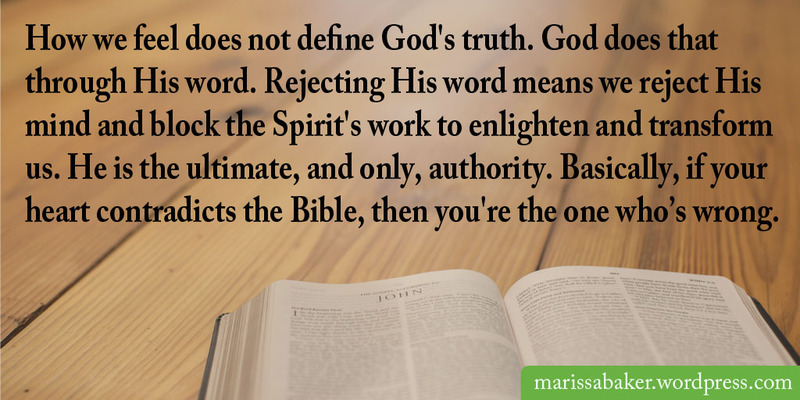 God defines truth. Those truths are contained in His word (John 17:17), His law (Ps. 119:142), and His commandments (Ps. 119:151). Either you accept His standards as the basis for truth, or you’re not a Christian. You might be a decent sort of person on the whole, but you’re certainly not a follower of Christ. The Bible is our main link with God. It’s how He has revealed Himself to us. Rejecting the standards outlined in God’s word means we reject His mind and block the Spirit’s work to enlighten and transform us. Accepting an outside source as our ultimate authority doesn’t sit well with modern society. We tend to focus on individual freedom and self expression to the exclusion of objective morality. But the Bible says “Cursed is the man who trusts in man and makes flesh his strength, whose heart departs from the Lord” (Jer. 17:5). A heart following its own desires is moving away from God. We can’t always trust our own feelings about something because God’s the only one who can reliably decode our hearts. It is true that the more we become like God, the more reliable our consciences will be. And He does work to transform our hearts and make them like His by writing His law in us (Heb. 8:10-11). But on it’s own, the human heart is a poor guide for making good decisions. With God’s help, we’re meant to come to a point where we can discern between good and evil (Heb. 5:14), where our thoughts are obedient to Christ (2 Cor. 10:3-6), and our hearts don’t condemn us because we’re in the truth (1 John 3:18-21). That’s doesn’t happen overnight, though, and there’s a simple test to know if we’re getting closer. If your heart contradicts the Bible, then you’re wrong. When we disagree with God, He’s never the one who’s in error. Just because He gave us free will and independent thought doesn’t mean we can know better than Him. We can choose to reject His authority and decide our way is “better,” but ultimately His promises for the world will come to pass and we will be judged according to His standards. One thing I’ve (mostly) learned to accept is that I can have faith without always understanding the “why?” Sometimes, you just have to do what God tells you before you understand because you believe in Him as Lord. And I’ve found that as I grow in my faith, He does answer many of my questions. He is faithful to open minds committed to learning from and following Him. But I also know I’m not going to get all the answers in this life. We simply aren’t capable of comprehending everything God is and knows. It might be frustrating to know our thoughts won’t be like God’s in this life. We often like the idea that if we just apply ourselves diligently enough we can figure things out on our own. That’s not the case in our Christian walks. The only way for our minds to get off earth and aim toward heaven is by admitting we can’t do it alone. In 1 Corinthians, Paul writes that the natural man can’t comprehend things of God’s Spirit. But we can know truths about and from God through His Spirit (1 Cor. 2:9-14). Before that happens, though, we must do what Isaiah talked about in the verses leading up to the “my thoughts are not your thoughts” passage. We’re expected to forsake wicked ways and unrighteous thoughts when we ask God for a relationship with Him. In the Hebrew of this passage, God is called YHVH, the eternal self-existent One. It should be both awe-inspiring and comforting to think of God in this way. We’re not asked to obey a fallible sort of creature operating on our level. We’re asked to submit to the unending, infallible authority of the Creator of the universe. That leads us to a couple other words translated “Lord.” We often use this name to refer to God, and rightly so, but I think we’ve lost track of what it means. In Hebrew, the word is adon (H113) and in Greek it’s kurios (G2962). Both are the title for owner, ruler, and master. Adon carries the sense of strength and firmness, along with a sovereign right to be in control. Kurios relates to having supreme authority. Everyone wants to talk about the loving savior aspects of God, but not so much His authority. But we can’t pick and choose what we like about God. He is Who He is and we owe Him certain things, regardless of how we feel. We can say Jesus is Lord, but do we really believe He is our owner, master, and ruler? We can call the Father Adonai, but do we acknowledge His firm, immutable right as sovereign authority? Let’s not be among those who despise the Lord by rejecting His authority to rule in in our lives. One of the simplest truths about being a follower of Christ is that you actually have to listen to Him. It can also be one of the hardest. But with His spirit in us, it is possible to follow the Lord rather than our own hearts. He’s there, waiting to help us when we seek Him. I can’t even express how true this rings nor how well you have expressed it. Very true and very well. Nay, extremely. Thank you.